Well, Kamakura is a town, which was once the capital city established by Minamoto samurai clan, located in Kanagawa Prefecture in the south from Tokyo. I chose a new, beautiful ice cream President Obama doesn’t know. Its photo is at the last of this post. Before an ice cream break, go for the main purposes. 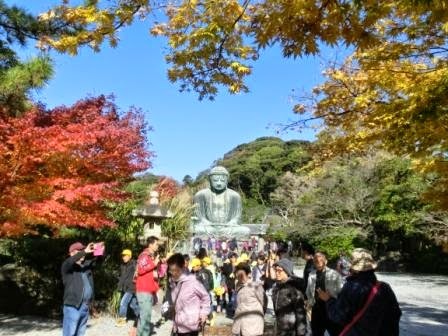 They are Hasedera Temple and the Great Buddha with autumn leaves. 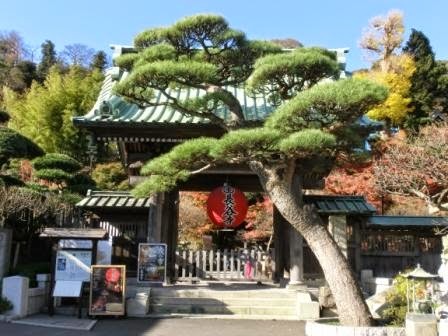 Kamakura is a beautiful place if you hope to visit a historical, cultural place from Tokyo. Let’s start with a history class. Talking about the capital of Japan, it was relocated some times in the long history. Eliminating uncertain or small things to simplify it, the first capital was Nara in Western Japan (710 -,) then Kyoto (794 -,) and the next is Kamakura (1192 -). After the age of wars between many samurai clans, Tokyo (once called Yedo) became the capital city in 1603 by Tokugawa clan. Kyoto was the capital of nobles and much of Japanese culture bloomed there, especially after stopping trades with Tang Empire of China. Samurais were guards of emperors and nobles, but they gradually became powerful. Finally the emperor lent the entire of political power to Minamoto samurai clan, which meant the end of aristocracy. Yoritomo Minamoto established his capital city in Kamakura, the southern town from Tokyo, so culture of samurais bloomed there. That’s why Japanese middle age culture gathers in Kamakura.Today, many students, Japanese and international tourists visit there for sightseeing. President Obama’s mother is one of them. There are so many to mention to in Kamakura that I can start Kamakura Direct Diary. 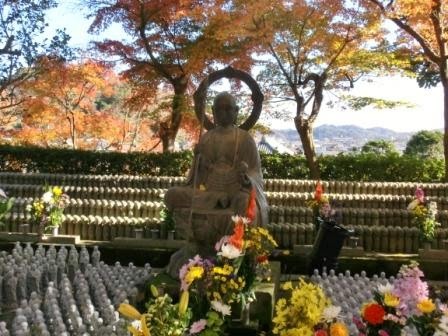 In this post, I push Hasedera Temple and the Great Buddha based on my own impressive experiences. 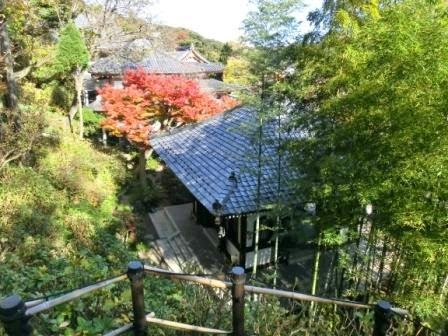 Originally established in 738, Hasedera Temple has been a famous Buddhist temple. I remember my first visit to Hasedera Temple. I was a junior high school student. I went there on a school trip. I hadn’t expect much of Hasedera Temple.But I got impressed by it more than the Great Buddha. Why? The 3 reasons come below. Explore the beautiful autumn colors, and you’ll agree with me! 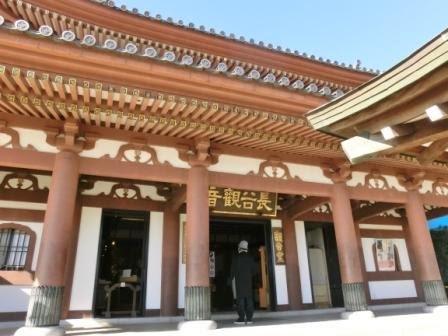 Hasedera Temple is known as a place to pray for babies who unfortunately couldn’t be born to this world. All the small statues are memorials from the parents. I’m sure that the babies are happy to rest in such a beautiful place. My attention on the school trip was on the Great Buddha because a BIG thing attracts people! But in Hasedera Temple, too, the 9.18 meter Buddha welcomes us in the main building. Very BIG! And Golden! It was beyond my expectations. In a building, I have to look up a statue of 9.18 meters high. It looks solemn and beautiful. I hadn’t expected views to a temple, but the scenery was breathtaking with the cool salty winds from the sea. The height of any houses and buildings are restricted to protect the views in Kamakura. And you’ll see the location is very interesting; Kamakura has the sea and mountains in a very short distance. Samurais (= warriors) chose this place as their capital for battles. I had had no idea to meet flourishing hydrangeas there. Ajisai is an icon of Japanese June, which is the rainy season. It was rainy on the day of my school trip, but the rain rather made hydrangeas so brilliant. I cannot forget them. It’s autumn, so the path has nothing but dead grass, but in June, the famous hydrangea path comes back instead of fall leaves. Well, you’ll find beautiful things anywhere in Hasedera Temple, but let me refer to 2 more things. They have many annual events and Watch-night is coming at this moment. They hold Manto-kigan-e, where they send people’s wishes to new year with thousands of candles. 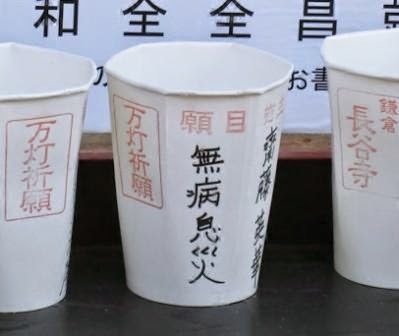 You write your name and wish on the candle cup. It’s all right to write in your language. I left a candle. My wish? To have a debut as a writer. I have sent this wish to stars on Tanabata and every chance. My will is strong. One more. Try this cave. A lot of stone statues are in the narrow cave. Isn’t it exciting to enter such a place? I said Hasedera Temple was more impressive than the Great Buddha when I was a junior high student, but I’m not saying that the Great Buddha is not impressive. At all! 13.35 meters high and 121 tons. BIG. He has been looking down the entire of Kamakura town since the 13th century. Finally an ice cream break. Not just Matcha ice cream, but Ajisai Mix Soft Cream! Matcha & Sweet Potato Ice Cream!! 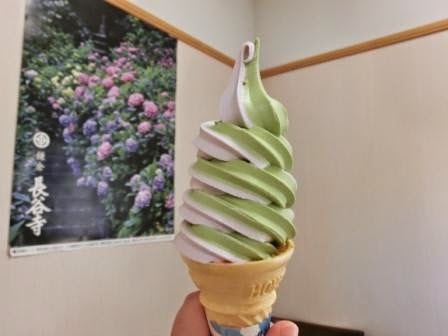 The green cream is Matcha green tea flavor, and the lavender is sweet potato. With these 2 colors, it looks like Hydrangea Path. Compare it with Hasedera Temple poster on the back! I am a grown-up, so I didn’t forget the historical temples after this delicious soft cream!! This is the last Autumn post of this year. I strongly felt so. Fall leaves are leaving in December. 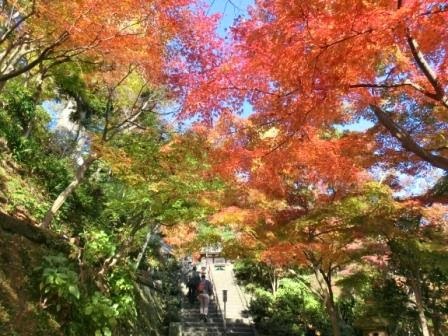 Wait for winter beauty in Tokyo! 60 minutes from Tokyo Station, 50 minutes from Shinagawa, on JR Yokosuka Line. 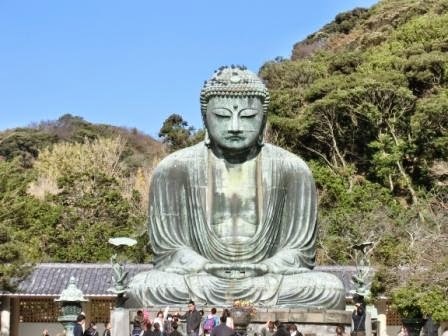 To Hasedera Temple and the Great Buddha, change trains at Kamakura Station into Enoshima Line (Its nickname is Eno-Den) and get off at Hase, the 3rd station. Kamakura is a terminal of Enoshima Line. 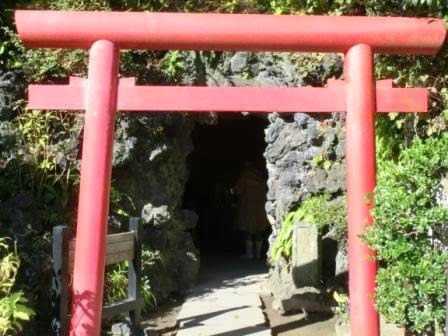 In Kamakura – A day trip from Tokyo is enough to explore these 2 places, but if you wish to stay in Kamakura to see more, you will find a good hotel in the famous sightseeing town. In Yokohama, the central city of Kanagawa Prefecture – Yokohama is a large city in a cool bay side area in East Japan. It has brilliant images with international ports since the 19th century. Yokohama is one of the biggest station in JR Yokosuka Line. In Tokyo Station – 60 minutes to Kamakura. Tokyo station is the very central station of Tokyo. 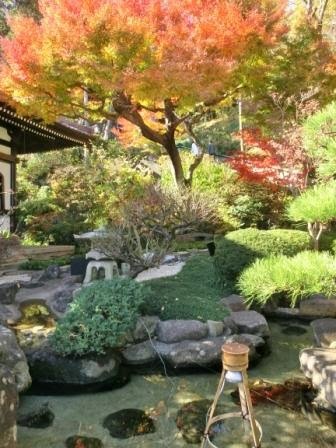 I love the autumn colours, and the temple is amazing – but I'd probably head straight for the ice cream!!! Have a great day, my friend! Talking about Matcha ice cream, there are traditional to modern ones. Never get bored! 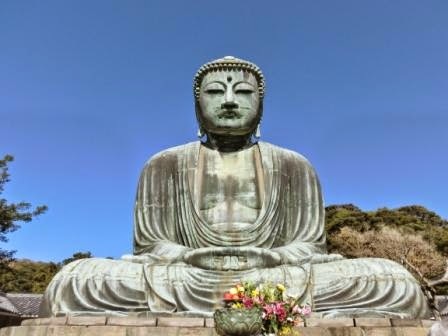 Buddha statue of Kamakura is one of the most popular buddhist pilgrimage sites in Japan. I have heard quite a lot about this great Buddha statue. That's quite a lot of information about the surroundings around the Kamakura Great Buddha. Yeah, Kamakura is such an interesting district with traditional culture and nature. Hopefully I'll talk about Kamakura again in June. Pleased to hear that you enjoyed this post!